A course on astronomy requires you to try to understand much larger numbers and much larger units of measurement than we are used to in our day to day experience. For example, we have already studied the distances to stars, the sizes of galaxies, and the age of the observable universe, all of which are very large (tens of trillions of kilometers, millions of trillions of kilometers, billions of years). Now that we are studying the Solar System, the planets are tiny relative to stars, galaxies, and the universe. With this in mind, though, if we compare the planets to each other, Jupiter is the largest, and it is an immense planet. In our everyday experience, Earth seems large, since it has a diameter of more than 12,000 kilometers. Jupiter is about 12 times larger in radius, which means that it is about 1400 times larger in volume than the Earth (that is, about 1400 Earths could fit inside Jupiter). If you recall our discussion of density previously, water has a density of exactly 1g/ cm 3 . Does this mean that Jupiter is made of water, and if so, what form is it in (water vapor, ice, liquid water)? In fact, Jupiter is not made of water. Its composition is very similar to the Sun's. It is made up primarily of Hydrogen and Helium, with traces of other elements and molecules. Observations of Jupiter show us that what we see as its “surface” is in fact its atmosphere—the observable portion of this planet is entirely gaseous. Look at the following image from the Cassini satellite. If you look at some of the fine details in the image, you will not see anything that looks like the continents on Earth, the craters on Mercury, or the rocky plains of Mars. Instead, it looks more like the clouds of Venus, which obscure that planet's surface. Animations, such as the Cassini movie of the Great Red Spot produced from images taken by the Cassini satellite, show that the visible atmosphere is in constant motion, and even appears to have nearly circular storms that do not look all that different from hurricanes on Earth. The atmosphere of Jupiter shows a lot of structure. It has alternating dark and light colored bands, which are not smooth, but which contain swirls and eddies. One of the reasons for the banded structure in Jupiter's appearance is that convection is occurring in the atmosphere. Convection occurs when you have a temperature difference between the layers in a liquid or gas. The common example is putting cream in a cup of coffee—since the cream is colder than the coffee, it sinks to the bottom, where it heats up. Then, when it heats up, it rises to the top, where it cools off, and then sinks again. So the process of convection creates a circular current in the fluid. This is going on in Jupiter's atmosphere, and what we observe as the different colored bands are actually different layers in the atmosphere. The light-colored areas (called zones) are the bands that are rising, while the dark-colored areas (called belts) are the layers that are sinking. As the “air” (the mix of gases that makes up Jupiter's atmosphere, which is different than air on Earth) rises, clouds form out of different materials—water, ammonium hydrosulfide, and ammonia. The whitish zones are the high layers of ammonia clouds, while the darker belts are the lower layers of ammonium hydrosulfide clouds. The exact cause of the colors remains an open question for researchers. Inside the clouds, reactions between sunlight, lightning, and different chemical compounds probably give rise to the variety of colors seen in Jupiter's atmosphere, but exactly what processes give rise to which colors has not been determined yet. Jupiter has been visited by several missions, the most recent being Juno. Juno passed very close to Jupiter, and, in particular, studied its polar regions. This mission revealed previously unknown details about Jupiter, like every NASA Solar System exploration does when it visits a world. Smaller storms in Jupiter's atmosphere appear, disappear, merge, and change in relatively short time scales. However, the Great Red Spot has persisted for at least 300 years. It can be seen to change over time. The Great Red Spot has some similarities to hurricanes on Earth, with the main difference being hurricanes are clockwise rotating, low pressure storms, while the Great Red Spot is a counterclockwise rotating, high pressure storm. On Earth, when these storms hit land, they can lose energy quickly, and the storm will dissipate. Since the Great Red Spot has not dissipated, this tells us that (1) there is some source of energy continually supplying it with enough to remain stable, and/or (2) there is no solid land underneath it to cause it to lose energy rapidly. Although astronomers have no direct way of observing Jupiter's interior, we have some evidence that suggests what it may be like. Although this planet is made up primarily of hydrogen and helium, which are found in gas form on Earth in normal conditions, the conditions in Jupiter's interior are unlike those on Earth. 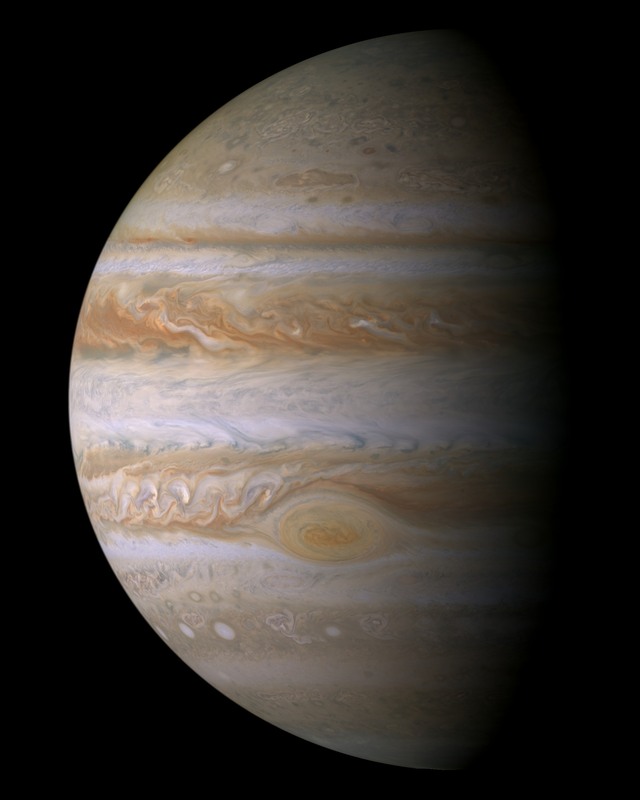 Given the temperature and pressure on Jupiter, we think that most of the planet is actually liquid hydrogen. What lies beneath this liquid layer is even more of a mystery. We expect that there may be a small solid core (about the size of the Earth) at the very center of Jupiter that is made up of rock, metals, and solid compounds of hydrogen. If you recall our discussions of the night sky, we discussed how many of the planets are easily visible to the naked eye. The inner planets do not emit any of their own light. Instead, they are visible because they reflect sunlight. This is not strictly true for Jupiter. If you measure how much total light it emits, it is more than the amount of sunlight that reaches the planet. Like the persistence of the Great Red Spot, which suggests some internal mechanism is providing energy to the cloud layers, the fact that Jupiter is giving off more light than it receives also suggests there is some internal energy generation. When we discussed protostars, we saw how they generated energy through gravitational contraction before nuclear fusion began. In the case of Jupiter, it does not contain enough mass to ever achieve the internal temperature and pressure to begin nuclear fusion, but it can generate energy through gravitational contraction.